Football takes first loss of season vs. Wash. & Jeff. On Saturday, Oct. 7, the football team set out to face Washington & Jefferson, their football rival for the day. The varsity team knew the stakes of the game and prepared extensively in hopes of beating them. Instead, Washington & Jefferson handed the Tartans their first loss of the year, bringing their record to 5–1 overall and 3–1 in Presidents’ Athletic Conference (PAC) play. The first quarter ended 7–0 in the Presidents’ favor. After calling their first timeout in the second quarter, the team was confronted with the Presidents’ second touchdown. Halftime seemed to consolidate the Tartans’ efforts as they made two touchdowns in the third quarter alone; at the end of the third quarter, the score was 20–13. The fourth quarter resulted in touchdowns for both Washington & Jefferson and the Tartans but presented a penalty that seriously hindered the Tartans’ efforts. After a fumble with the ball at 3:16 on the clock, the pass from junior quarterback Alex Cline to sophomore wide receiver Jamie Greenwell which gained the team 60 yards was called back due to a penalty. The game ended 27–20 in the Presidents’ favor. “They came out and they played great. I mean... [in the] second half we got the ball rolling a little bit and [were] feeling the chemistry between me and the receivers more. But [we] just came up short in the end,” said Cline. The Tartans were determined to beat Washington & Jefferson since their defeat would automatically qualify the team for the conference. Instead, the team will now have to prove themselves through the rest of their season games in order to make it to the conference and possibly the championship. Due to the significance of this game, the team researched Washington & Jefferson’s past plays and current players in hopes of gaining an advantage. This process consisted of the team watching games the team played in the past and then simulating the plays with other players. “They have a great wide receiver, #87, so we focused our playing on him a little bit while defensively focusing on taking care of the run plays and stopping their pass plays. Watching film and having our scout team simulate their offense [help us prep] for every game like it’s the best game we’re gonna play,” said Bikulege. The team honored Cindy Lackner, Coach Rich Lackner’s late wife, during the game through the organized effort to wear pink. Lackner, who died of breast cancer, has been honored annually for the past six years; proceeds of events such as raffles at the game are donated to research for breast cancer, as well. Organized efforts of the team to honor Lackner and succeed in their play did not go to waste; despite their loss, the team strengthened their plays through preparation for the game and improved as a collective unit. “My team was fighting their tails off the whole time; I can’t say anyone didn’t give 110 percent effort so I’m really happy with how our guys played. [I’m] really proud of my team,” said Bikulege. 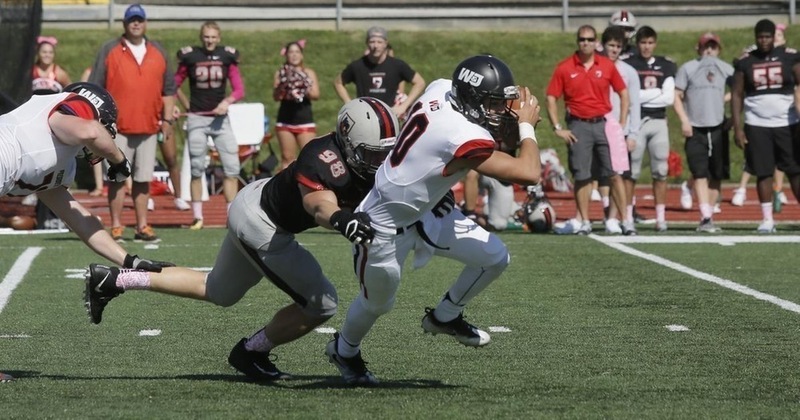 The Tartans will look to rebound against Geneva College on Saturday, Oct. 14.